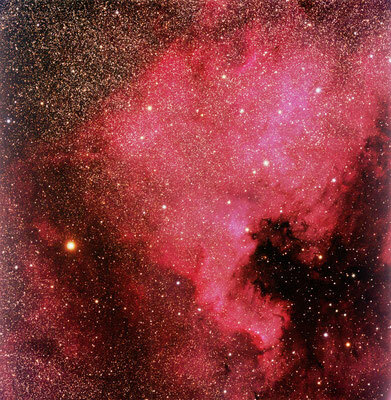 NGC 7000 is an emission nebula, meaning that its gaseous hydrogen, oxygen and sulphur are strongly irradiated by ultraviolet light from a nearby star. This ionizes the nebula, causing its gasses to fluoresce in various wavelengths of red light. 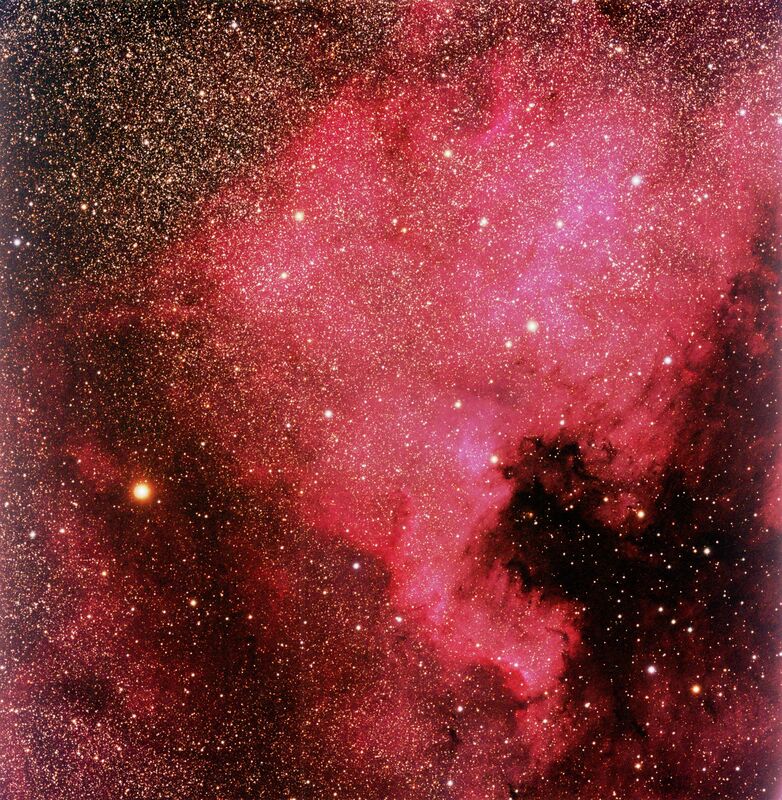 The star in this case is probably Deneb, the bright star marking the tail of the swan Cygnus. If Deneb is the UV-source, then the distance to NGC 700 is 1600 light years, only 300 light years farther than the much brighter Orion Nebula. The breadth of the North America Nebula is about 100 light years. suffers from vignetting and noise. At 59 degrees north latitude, the night sky reaches maximum darkness 27th August. This is the first night after 21st April when the sun sinks to more than 18 degrees below the horizon. Eighteen degrees is the minimum limit for astronomical night, because the upper reaches of atmosphere are not illuminated by the sun. 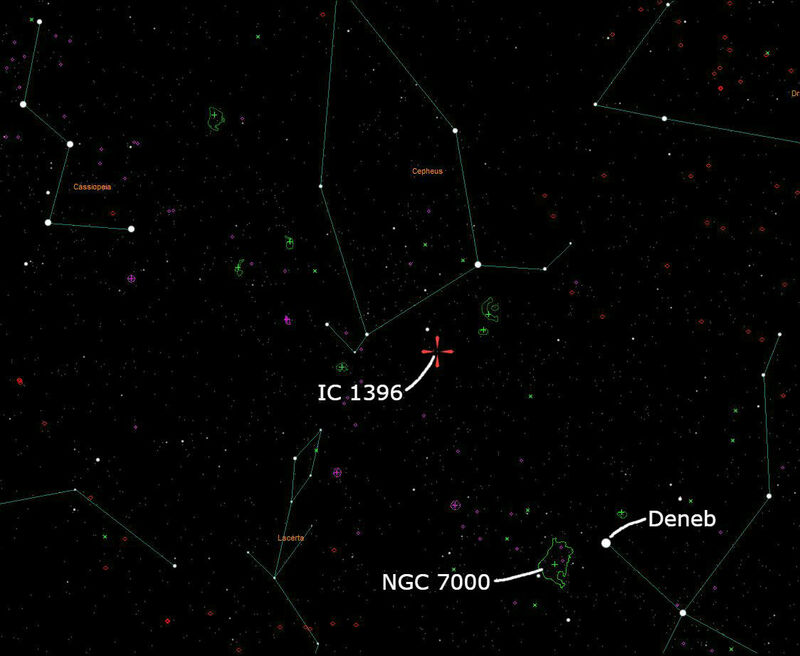 NGC 7000. Date: 5 Sept 2016, Loc: Rennesøy, Norway, Telescope: Esprit 120 ED, Camera: Apogee Alta U16M, Mount: ASA DDM160, Exposure: LRGB 6/6/6/6 min, Photographic field is 2.5 x 2.5 degrees.